The Prince of Wales delivered this year’s joint ICE and Halcrow Sustainability Lecture which took place in our Telford Theatre in front of a full house of 240 people. 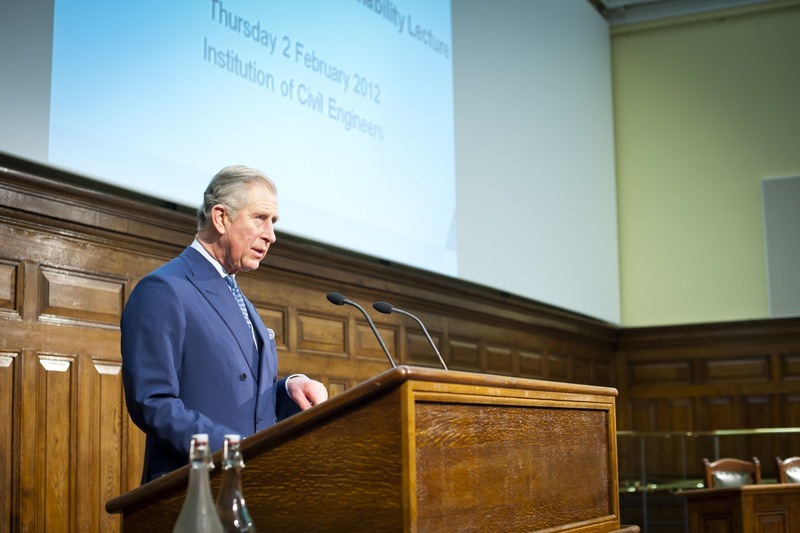 HRH’s lecture examined a variety of themes surrounding civil engineering and sustainability. Afterwards, a buffet lunch was offered to attendees while HRH was introduced to a number of people for further discussion. In the evening we were delighted that The Princess Royal graced us again with her presence at RedR’s Annual Patrons’ and Corporate Supporters Drinks Reception. The event is held to welcome new Patrons and to thank those who have given their time and support over the previous year. HRH has been President of the charity, which trains aid workers and provides skilled professionals to humanitarian programmes worldwide, since 1988 and as such has attended many other prestigious RedR events held at One Great George Street. Certificates were presented in our Great Hall to recognise three new Patrons after which HRH met a number of those present at a drinks reception in our most magnificent room which will be the main press working area when One Great George Street becomes the London Media Centre during the London 2012 Olympic and Paralympic Games. That’s it for now, got to dash. Who knows, I could have another celebrity or royal family member booking sat in my email inbox!